West Brom have completed a £750,000 swoop for Birmingham's Darren Purse. The 27-year-old has signed a three-year deal at The Hawthorns after agreeing personal terms and passing a medical. Albion have paid an initial £500,000 for centre-back Purse, who has struggled to dislodge Kenny Cunningham and Matthew Upson at Birmingham. "We've seen Darren play over the years including a few times against us, and he will be a good asset for us," said Baggies boss Gary Megson. 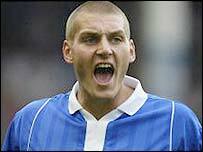 Purse was voted Birmingham's player-of-the-season in 2000/01 and has also picked up the Young Player of the Year award in his time at St Andrews. "He's comfortable on the ball, good in the air, strong and wants to get on and win. We're delighted to have him on board," added Megson. He scored an injury-time penalty against Liverpool to take the 2001 Worthington Cup final to extra-time before Birmingham lost on penalties. But Purse made just 12 appearances for the St Andrews outfit during the past campaign.